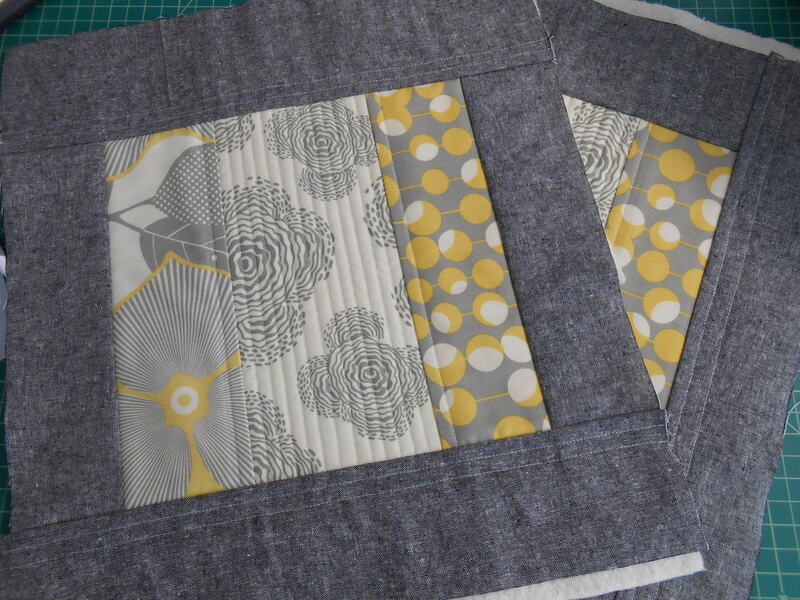 Now that you’ve made two quilted sections, trim them using a ruler and rotary cutter to be the same size. Mine are 14 ½ x 15 ½ inches. 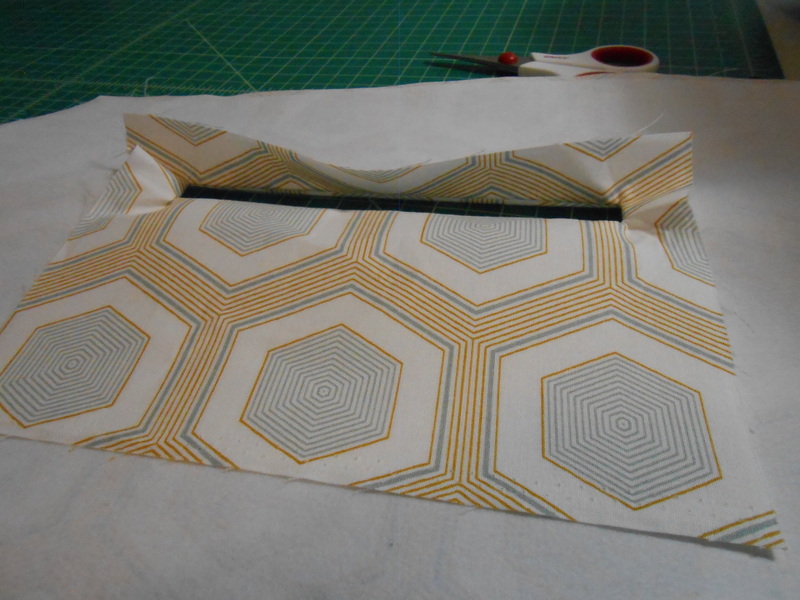 Cut two pieces of fabric the same size for the bag’s lining. Hint: fold a larger piece of fabric in half. 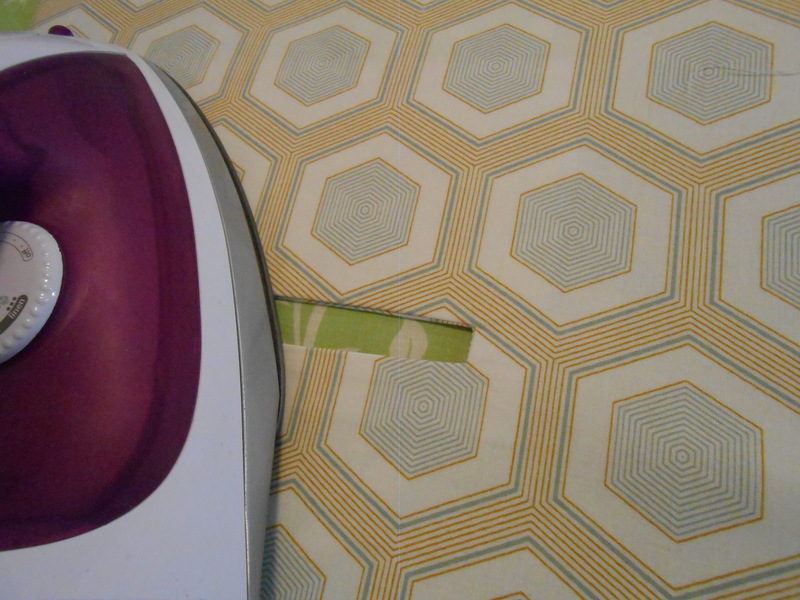 Lay one of the quilted pieces on top and use it as a guide along with your ruler to cut identically sized lining pieces. Just be sure not to cut through the quilted exterior fabric. 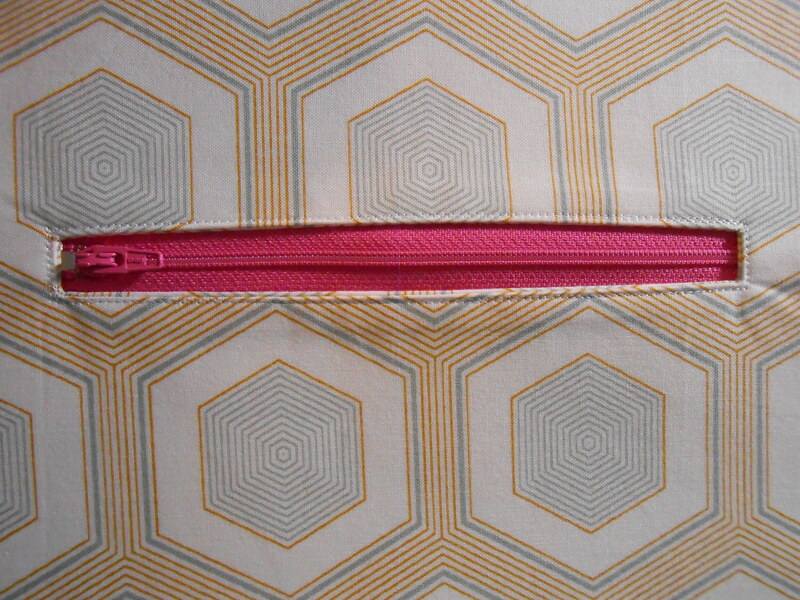 After I cut my lining, there were two smaller pieces of fabric I decided to use to make a zippered pocket. Mine were 8 ½ x 7 inches. 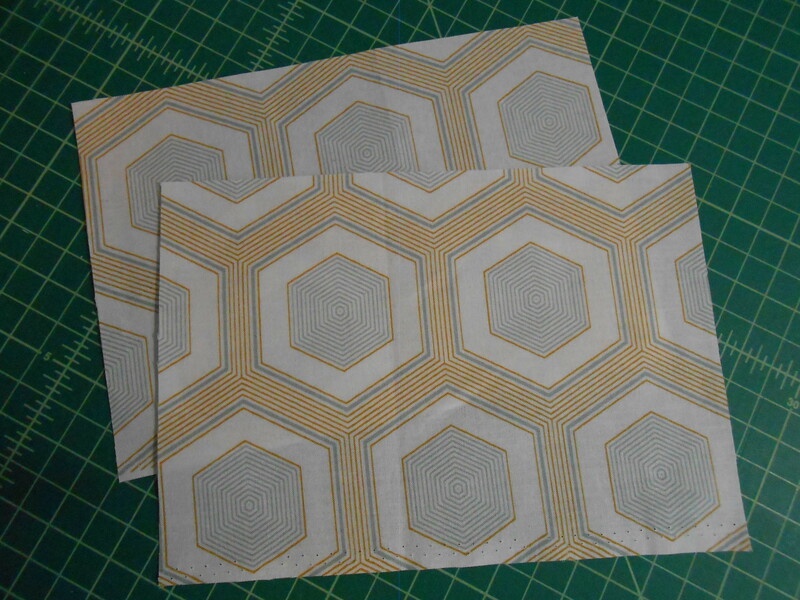 I also found two scraps about 4 x 6 inches (already interfaced) for an open interior pocket. 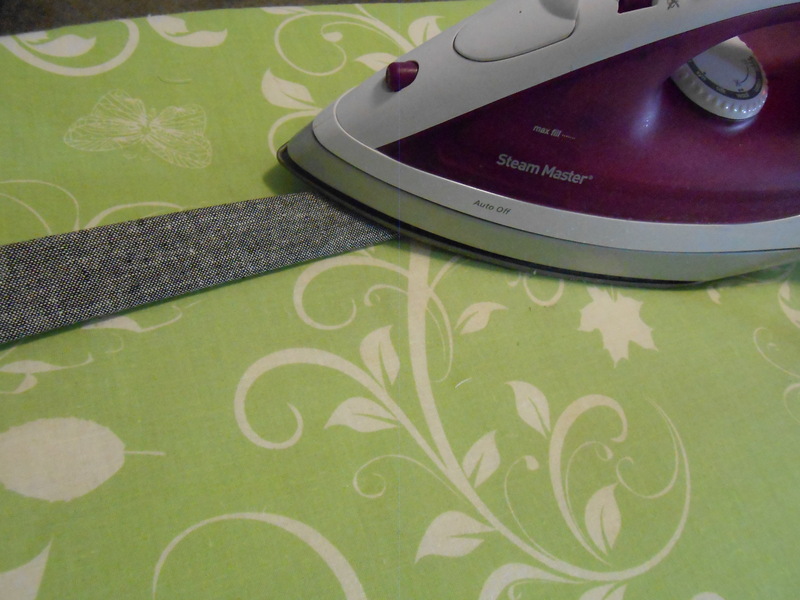 Iron on interfacing to all pieces using the manufacturer’s instructions. 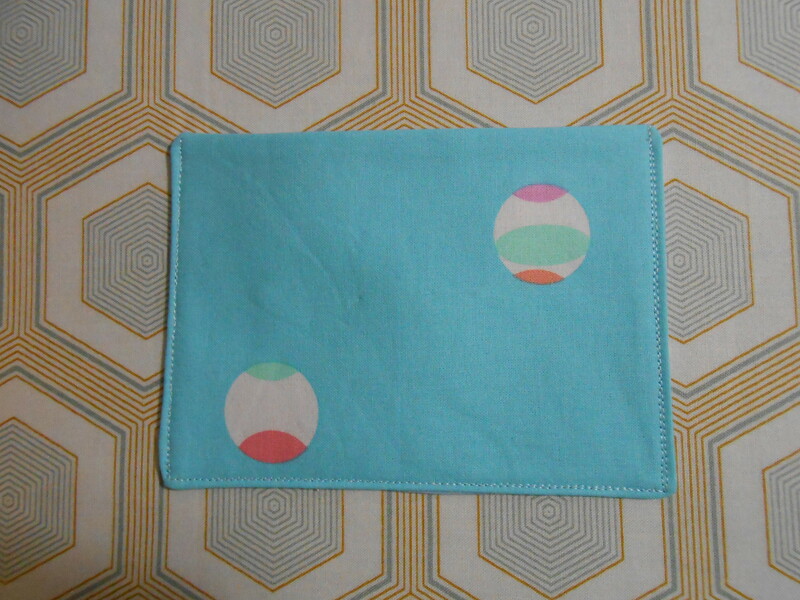 From a previous wallet making project I just happened to have a template I’d made for the zippered pocket. 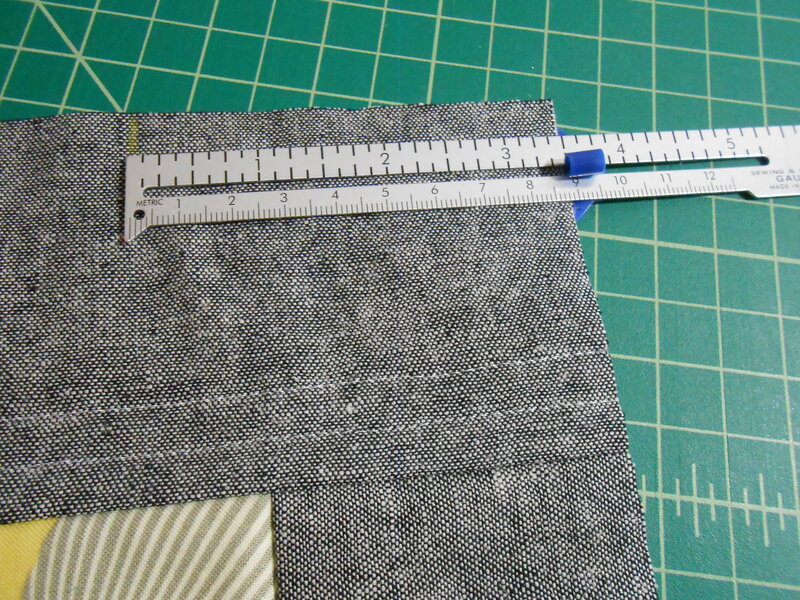 You will need to mark a ½ inch by 6 ½ inch rectangle on the wrong side of one of the zippered pocket pieces. 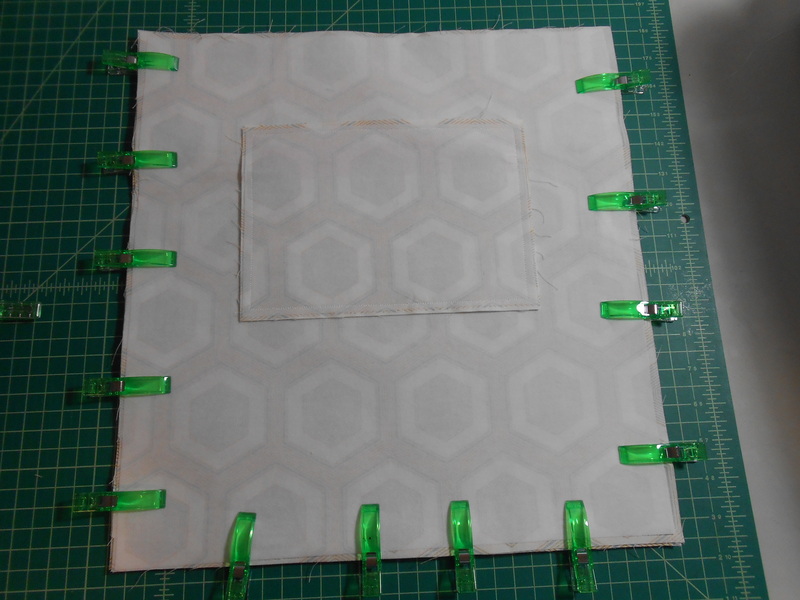 The rectangle will need to be one inch from each side and one inch from the top. 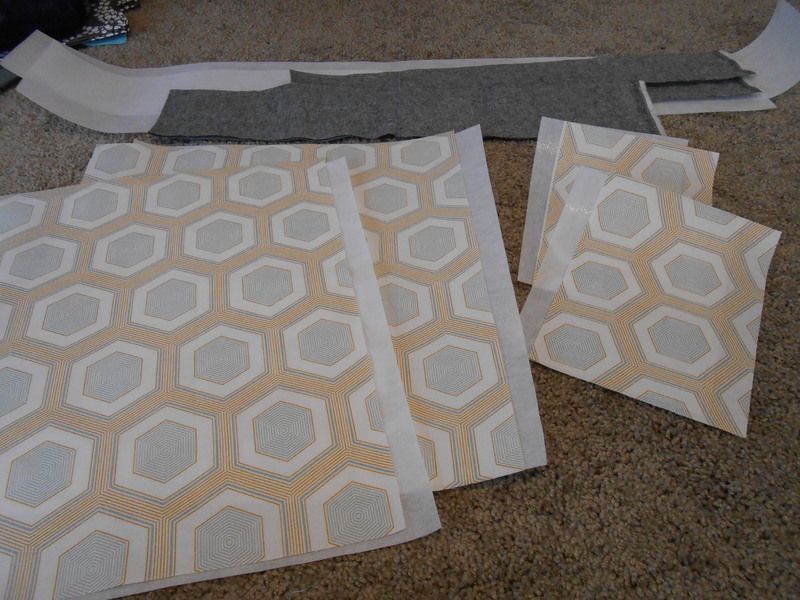 Lay this piece right side down (right sides together) with one of the lining pieces. Pin in place. 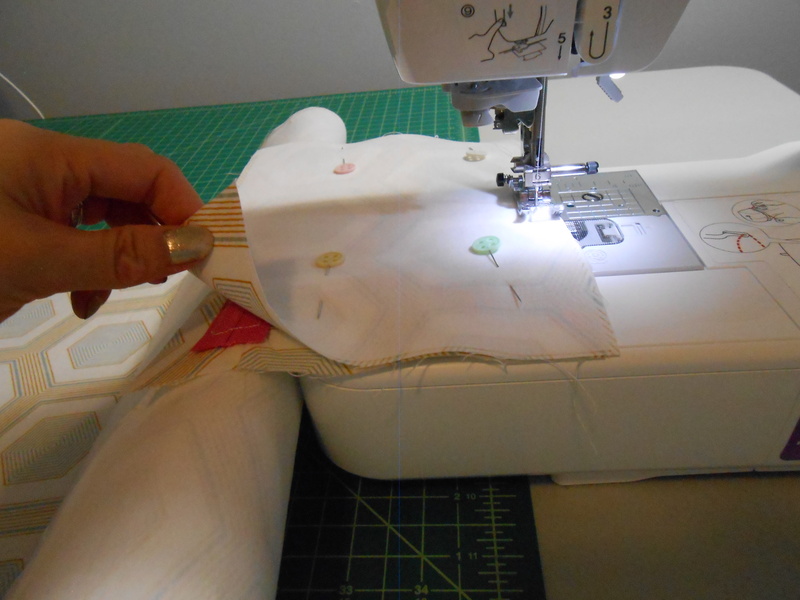 Sew on the marked lines – stitching around the rectangle twice. Hint: When piecing the bag together, I used a small stitch length of 1.4 for durability and wear and tear. 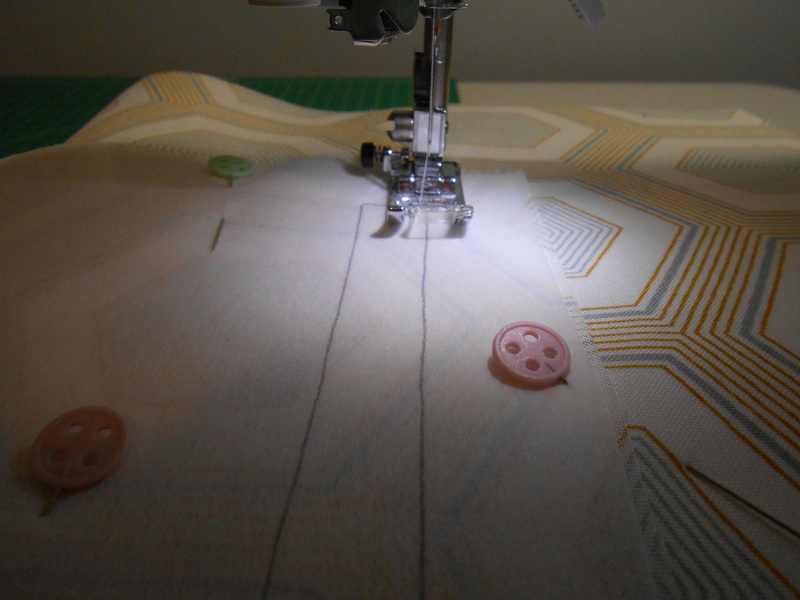 When topstitching or quilting – any time the stitches would be visible – I used a 2.5 stitch length. 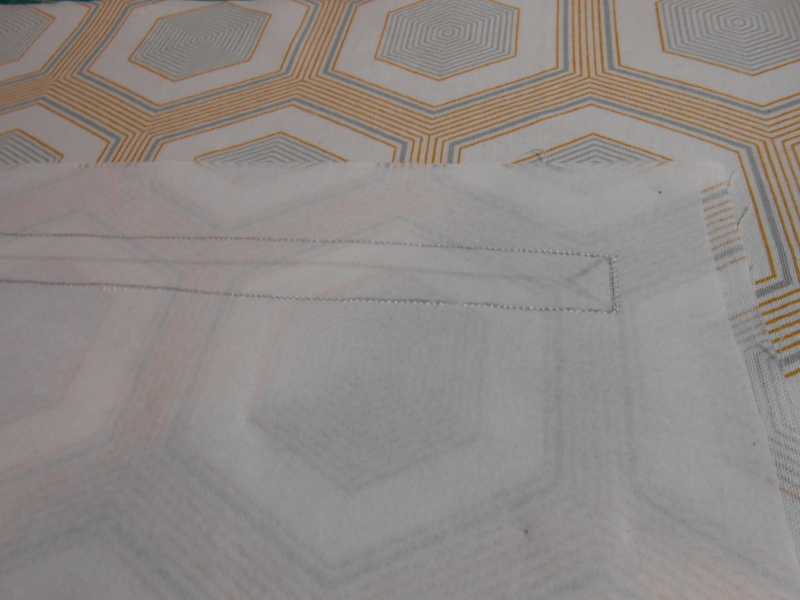 Mark a line down the middle of the rectangle but stop about a half inch before the short ends and draw a sideways “V” on each side as pictured above. 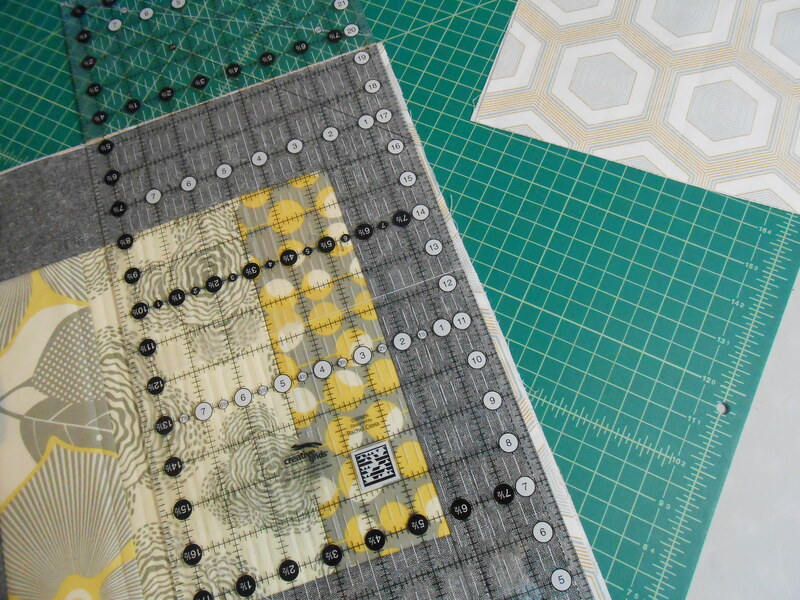 Using a rotary cutter and ruler, cut on the middle line, but stop before the ends. With small scissors, cut out the Vs but stop before you cut through the stitching. 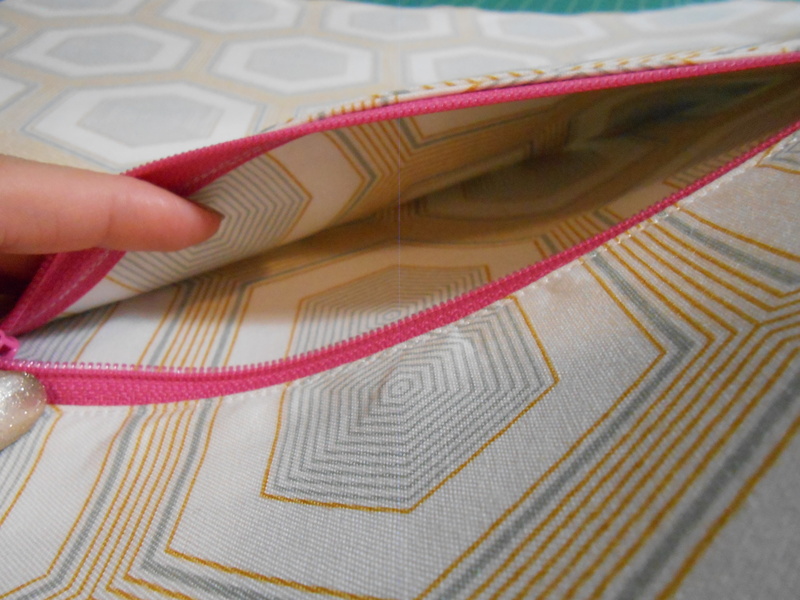 Turn the zippered pocket piece to the other side of the lining and press well. Your zipper should fit within the rectangle. 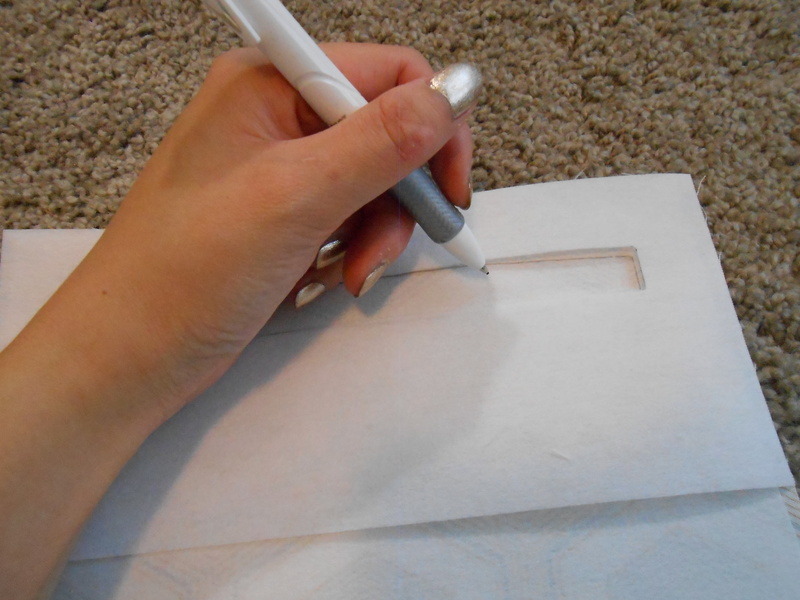 Hint: Use Elmer’s Washable School Glue in white to glue baste the zipper to the lining piece. Topstitch on the right side of the lining piece as close to the edge as comfortable. Take the other zippered pocket piece and place it right sides together with the first piece. Pin, and stitch completely closed on all sides. Place and pin the two open pocket pieces right sides together, sew around the perimeter – leaving about a 3-4 inch opening for turning. Turn, press, and place on the right side of the other lining piece, with the side containing the opening face down. Except for the top side, sew around the edges of the sides and bottom – which will close the opening. Next, take the two handle pieces and press in half on the long side. Then press the remaining halves to the center. Place the batting in the middle of each piece, press, and use Clover Wonder Clips to secure. Top stitch both sides of each handle – it will be easier to begin with the side that needs to be sewn closed. Hint: the batting is optional – it gives the handles a fuller look. 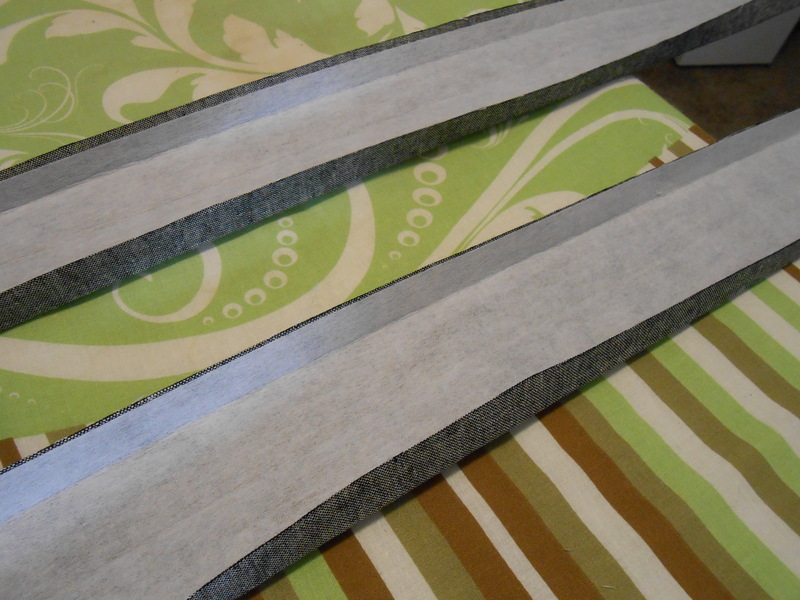 With just interfacing, the handles will be less bulky. 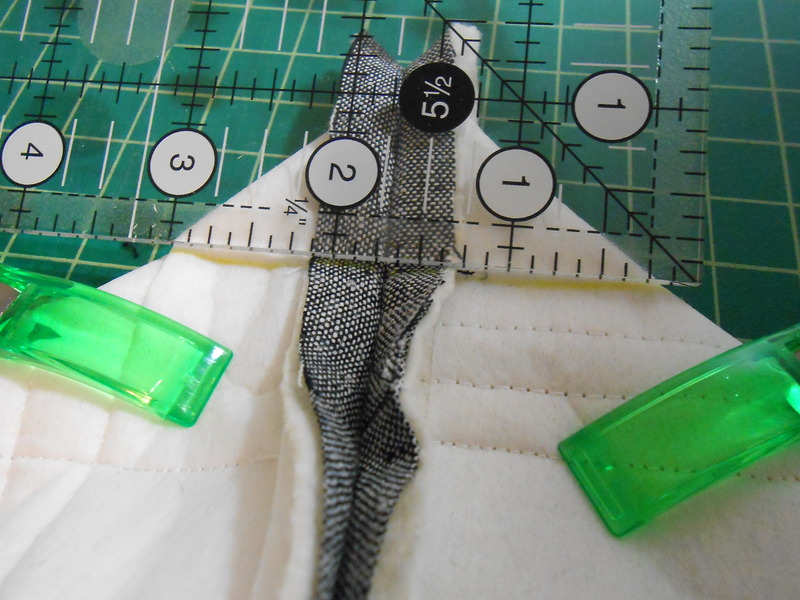 Place the lining pieces right sides together (make sure the pockets are both facing the same direction – so you don’t have one pocket up and one down) and sew the sides and bottom – I’d recommend using a 1/2 inch seam allowance. On both exterior sections – you will want to mark where the handles will be sewn on. With previous bags, I have made the mistake of placing the handles too far apart from the center. When you do this, the handles will not hang nicely when the tote bag is slung over your shoulder. Handle placement will depend on how large your bag is. Since the width is 14 1/2 inches, I made marks 3 1/2 inches in. I did not center the handle over the mark, but placed it so that the outside was right at the mark. 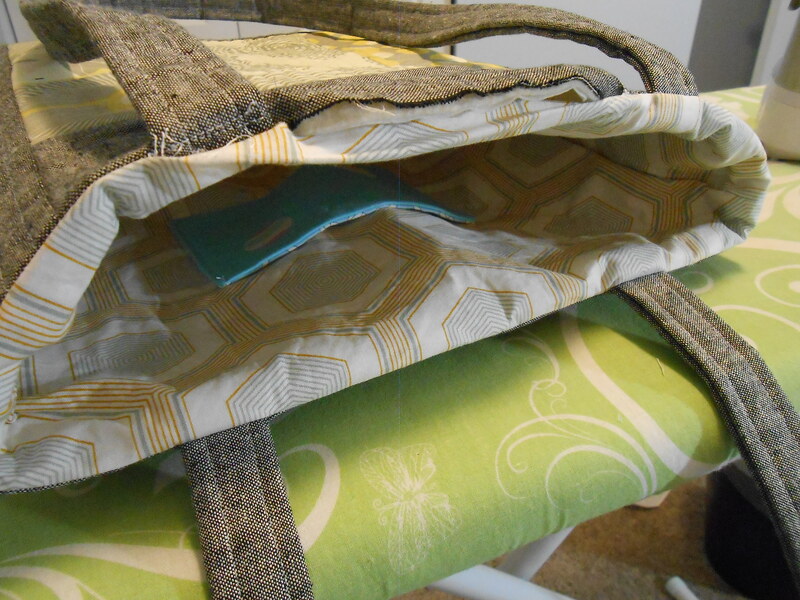 Sew each handle to the exterior pieces of the bag. 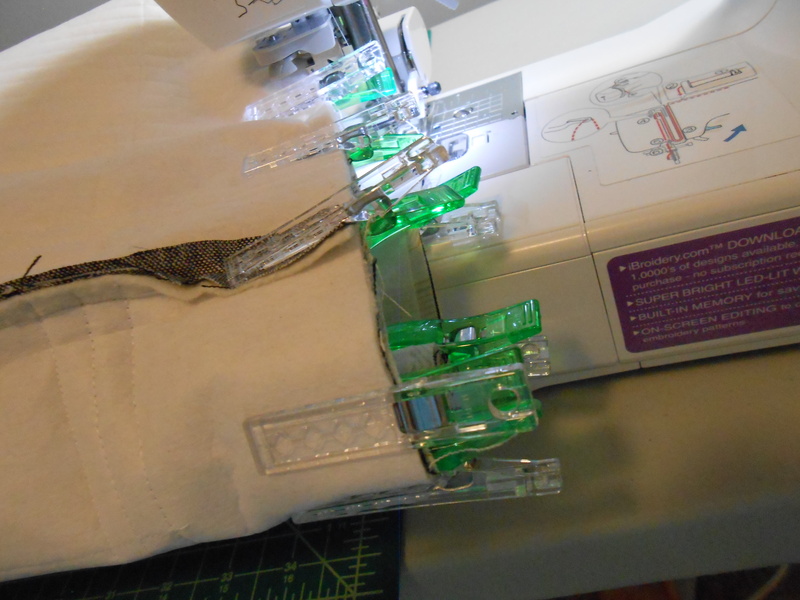 For reinforcement, stitch over the handles multiple times so the stitches don’t come loose. Hint: Use a small stitch length of 1.4. 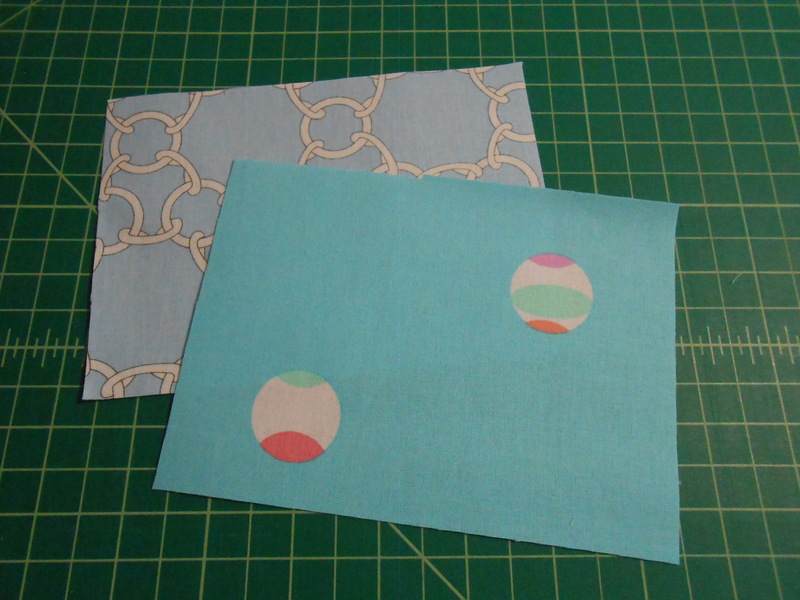 Place the exterior pieces right sides together and sew the sides and bottom – using a 1/2 inch seam allowance. 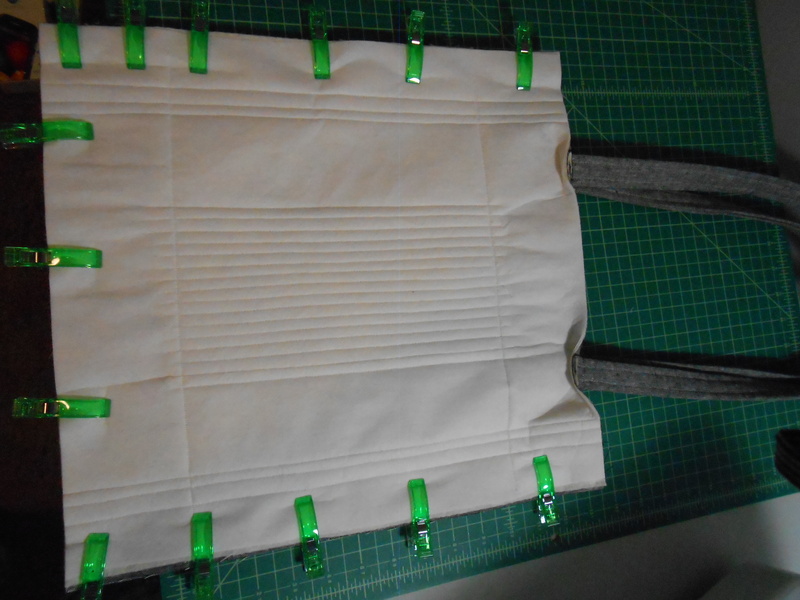 To create the bag and lining’s gusset, pinch the bottom corners as shown in the photo below. Make sure the seams match up on both sides, and clip/pin down. Mark a line 3 inches in from the end on all of the corners. 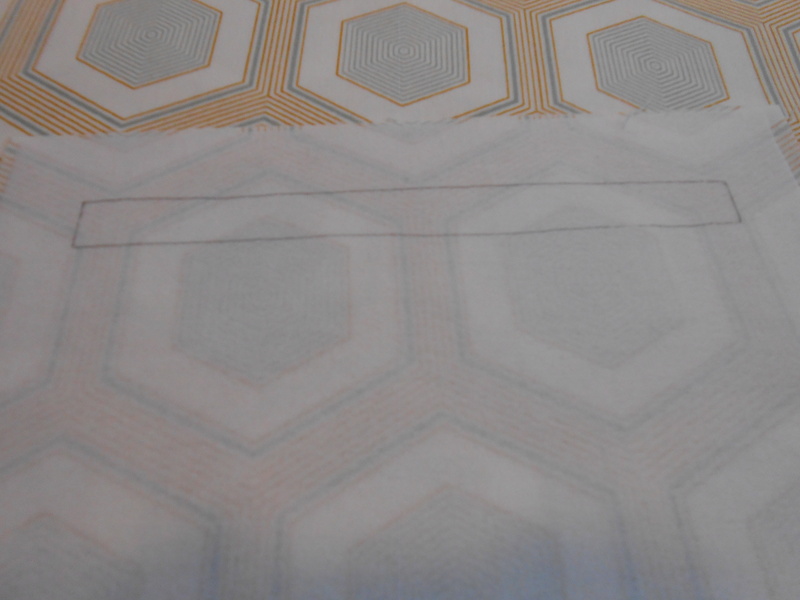 Stitch on each line a few times for extra reinforcement, then clip off the excess. Turn the lining right sides out, but keep the exterior piece wrong sides out. Fit the lining into the exterior, they should be right sides together. Using the Wonder Clips, secure the pieces together. 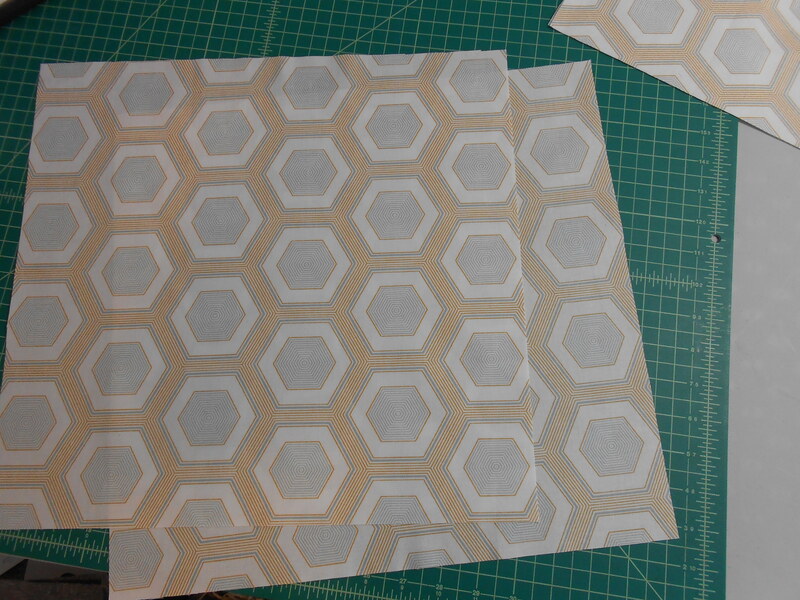 Hint: it’s easiest to start by matching up the two seams, then work your way into the middle between the handles. 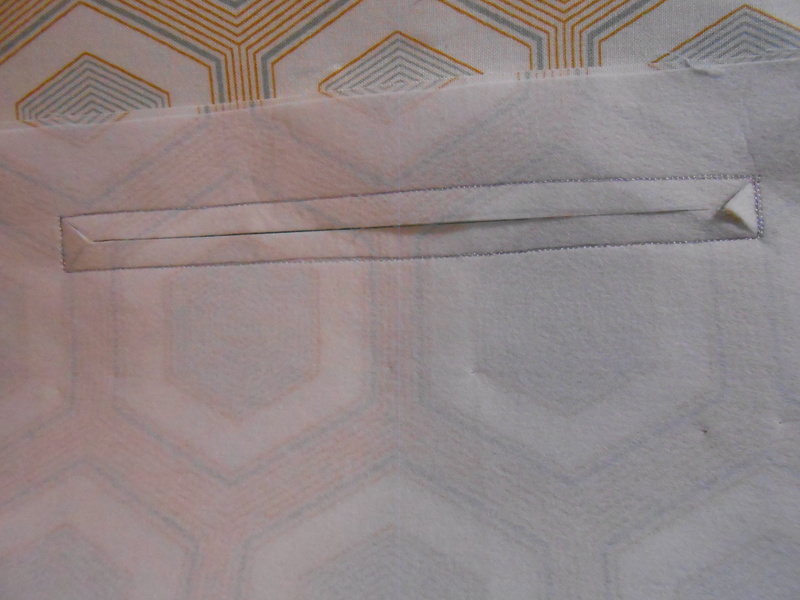 Press the seams – pay particular attention to the section that’s open. Use the Wonder Clips again to keep that section in place. Top stitch at least once around the edge. 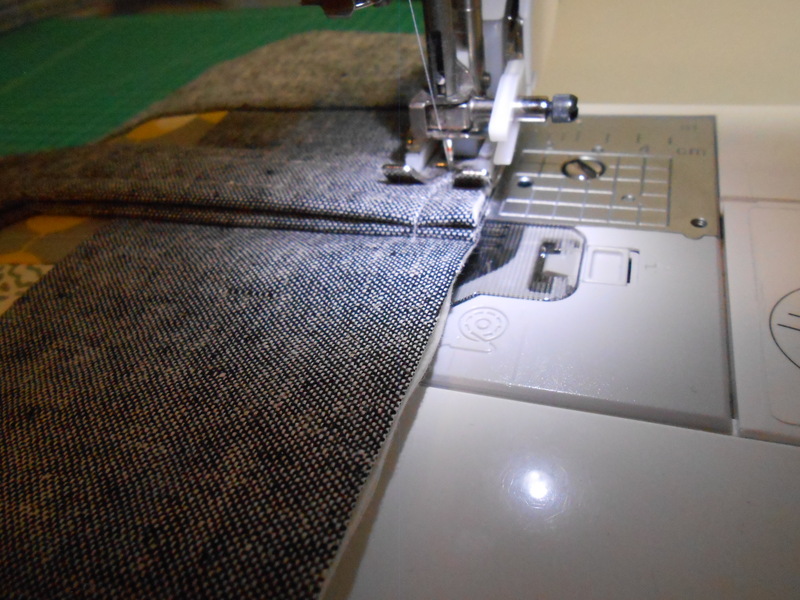 I chose to do two rows of top stitching since my handle had come undone. 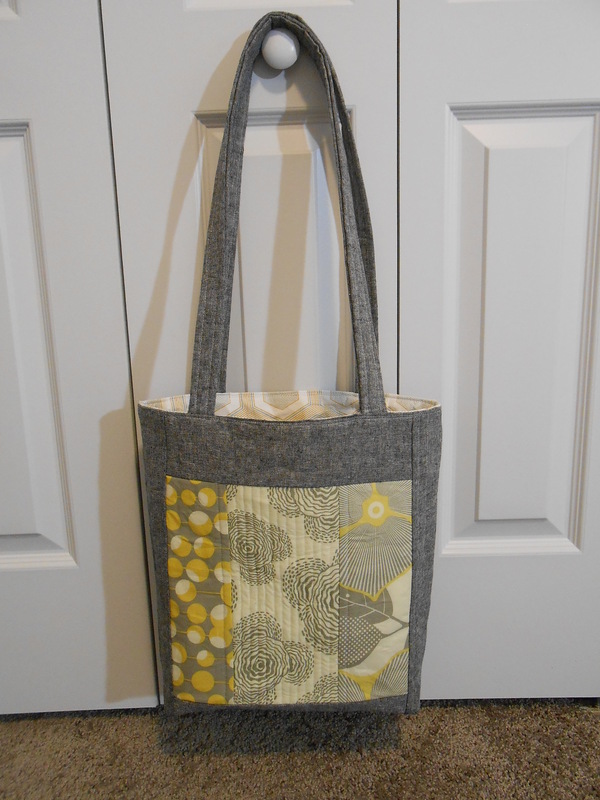 And there you have it – a finished tote bag! 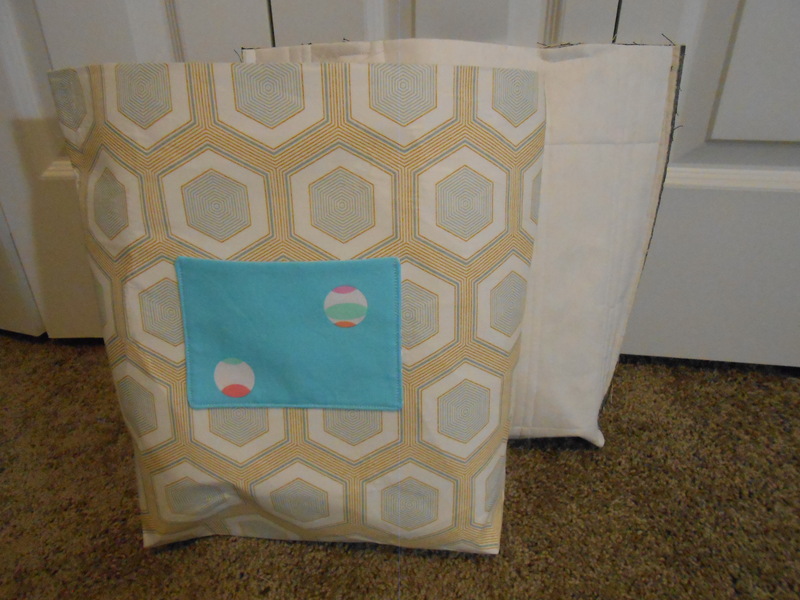 One Response to "Quilt-As-You-Go Tote Bag tutorial: Part 2"